Time for yet another iPhone 5S render, this time with the fingerprint scanner ring around the Home button. That’s a new aspect of the handset, that has appeared on the web over the past days. The folks of Yugatech implemented that new aspect on the iPhone 5S gold version shown above. As you know, tomorrow, on the 10th of September Apple has a big conference scheduled, that will finally bring us the iPhone 5S and 5C. The ring part appeared when the packing of the 5S leaked out and seemed to show a metallic highlighted area around the Home button. We’ve been hearing about such a scanner for a while now and this is pretty much its confirmation. 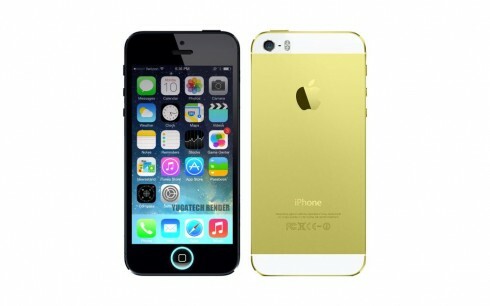 We also see a dual LED flash at the back and overall the same design as the iPhone 5. The gold color here in combo with the black facade looks strange. Maybe with a white front, it would look better.